It is a necessary task. The goal is to have the valuable findings stored on hard drive for extremely easy referencing access. I’m confident I will get through it all. Without need for much help. 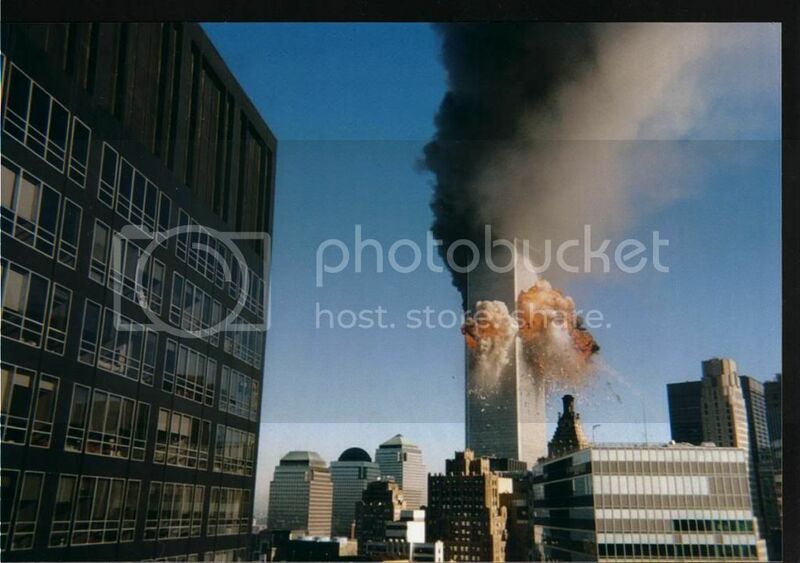 I have downloaded 9/11 TV archives, documentaries, and amateur footage. Here is an example of how accurate I can get archiving, with just one look at a Gif…. Fakery- frames to 'shear' in a manner not ascribable to any known video artifacts. Link/download/file...@ 911 TV Archive youtube channel. Obviously there are going too be ones where I do not have a clue where to find. I have decided to open a September clues archive thread. Where the forum can work together as a team. I will place the images In posts on this thread. Last edited by Equinox on Tue Sep 20, 2011 10:25 am, edited 3 times in total. Re: September Clues archive contributions. 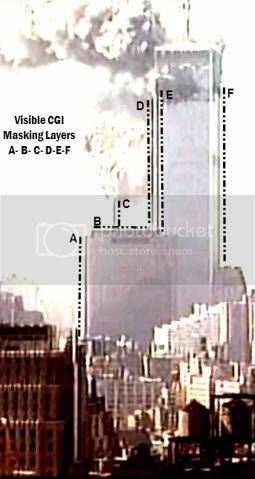 There are a few different clips (CBS etc..) on 9/11 taken from this area supposed to be West st.
1 is from “the falling man” shot. I found that easy enough. The CNN shot (west st ) Do you know roughly where it is located? Re: GETTING THE WORD OUT! Fraud- Masking lines appears on trade centre. 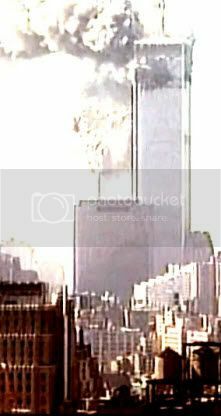 simonshack wrote: I sometimes wonder - after almost half-a-decade of analyzing the 9/11 imagery, just why it took such a long time or me (or anyone) to notice the atrocious crassness of it. 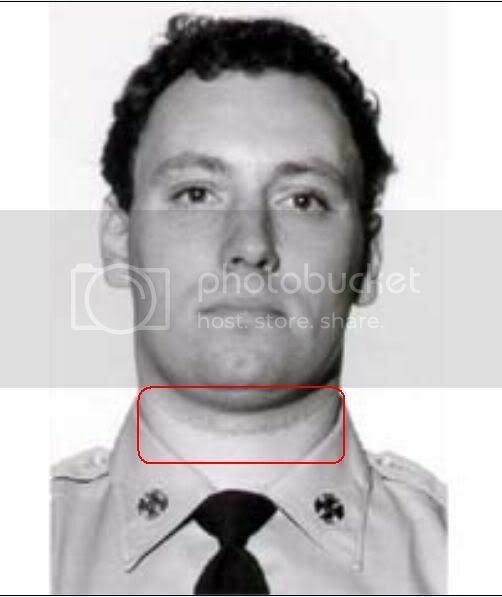 There are mysteries aplenty in this world, but this particular mystery (why I didn't fully grasp the evident bogusness of the entire pool of 9/11 imagery) has had me scratching my head for a long while. 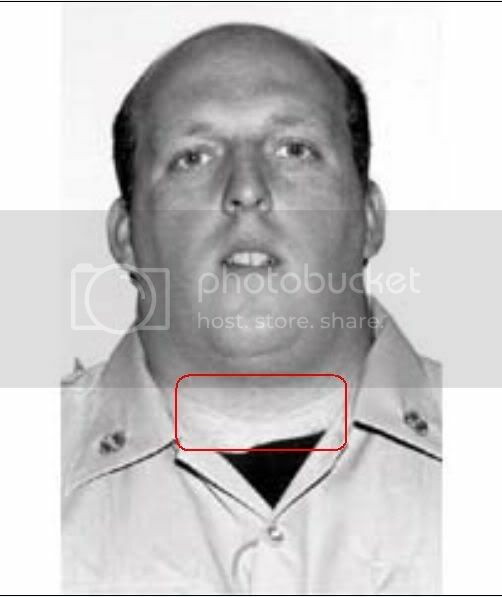 I now realize that this was all part of the 9/11 plotters' plan. 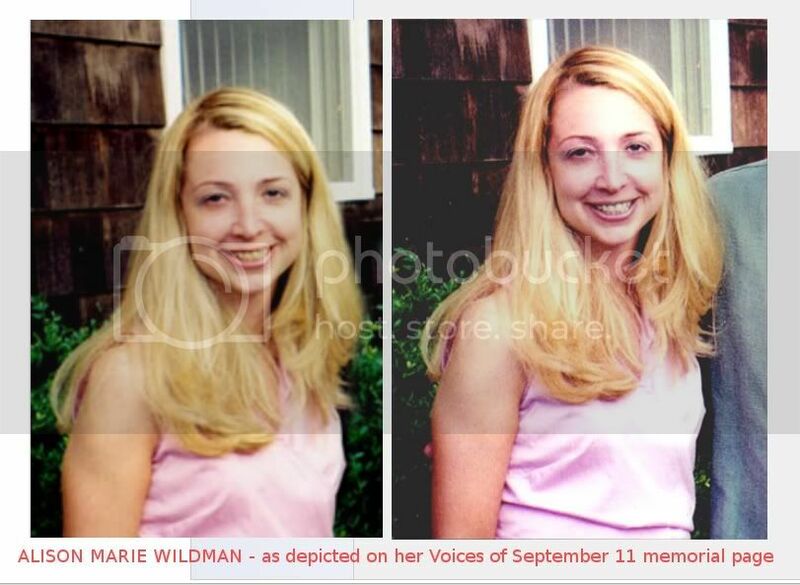 Back in 2007, I made my very first 9/11 imagery analysis: The Grand TV Illusion. Of course, I wasn't quite content with it: the poor quality video resolution at hand left me wondering if I had pushed too far my interpretation of the given visuals. Perhaps I was just looking at standard video artifacts - caused by digital conversions/compressions? 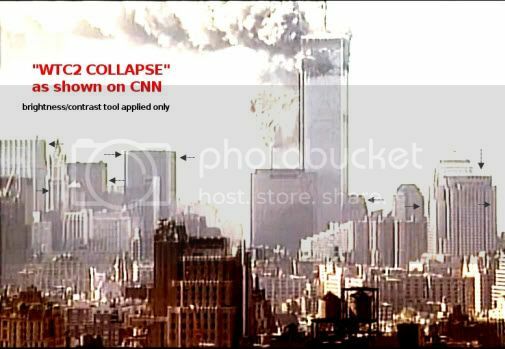 NOT ONLY WAS THE IMAGERY OF AN AIRPLANE IMPACTING THE WTC SHOWN ON TV a digital animation, ALSO THE WTC COLLAPSES were digital animations. All horizontal/ vertical masking lines/layers now visible. Highlighted all the masking layers/Lines. 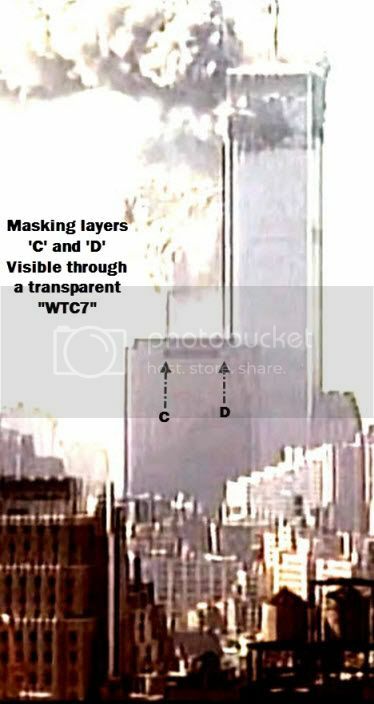 Layers "C" and "D" do actually appear through the WTC-7. A)---	It is filled with "horizontal" and "vertical" CGI with masking lines which are clearly visible. Last edited by Equinox on Thu Nov 08, 2012 9:19 pm, edited 3 times in total. Notes- None applied at current date. Last edited by Equinox on Mon Aug 06, 2012 8:58 pm, edited 3 times in total. 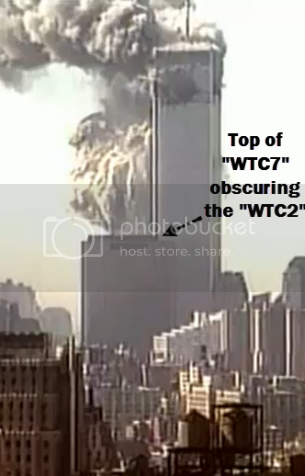 I always like footage of WTC1or2 'collapses' from top down; the weak, lightweight top (carried by the strong, heavy bottom for 30+ years) suddenly decides to crush the strong heavy bottom ... and creates a fountain of debris (broken concrete, steel, furniture, human beings, etc) as seen live on TV. For a professional engineer, like me, such a crush down is impossible in reality (http://heiwaco.tripod.com/tower.htm ) so what was seen must have been a Hollywood style, computer generated images, CGI, animation to confuse the viewers. I have evidently informed US law enforcement agency FBI and been told that FBI is not interested. It seems FBI supports US terrorism. VIDEO-- FINAL ASCENT - as aired on the BBC. FRAUD- The Entire trajectory is incorrect. 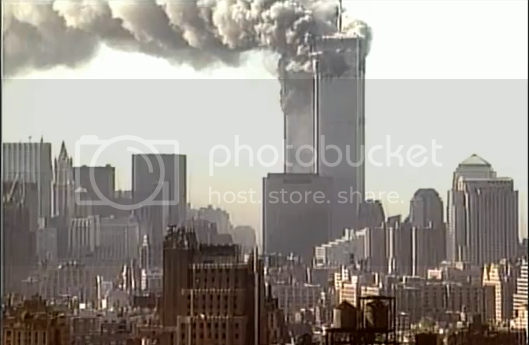 This other shot also depicts "Flight 175 - as it explodes". Hence, it is evidently (and supposedly) immediately successive to the shot. This claim is completely unbelievable. This claim is offensive to any photographer's intelligence. Bond analyst Will Nuñez had gone to his corner newsstand and bought a $14.99 disposable Kodak, hoping to record the smoking tower out his office window "for history's sake," he says. "I remembered an incident back in the thirties when a plane had hit the Empire State Building, and I was always impressed by photos in encyclopedias." 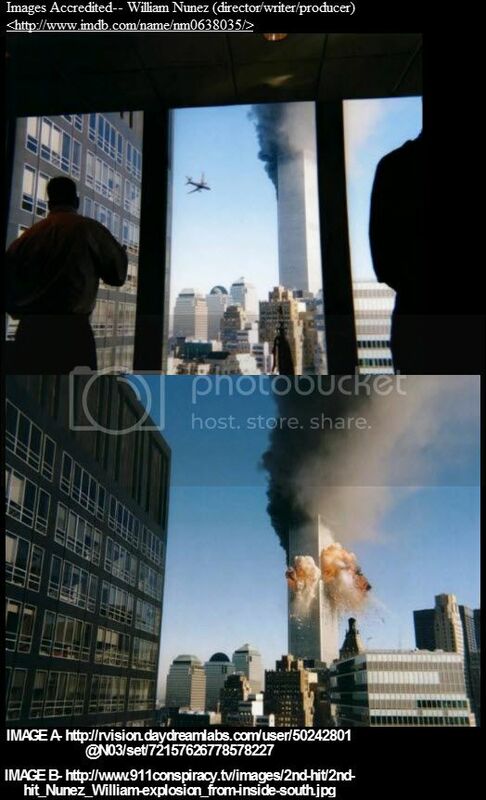 Instead, from his perch on the thirty-second floor of One State Street Plaza, he captured the plane's breathtaking blur out his office window, quite unintentionally. In his shot, a colleague, standing before a vast picture window, looks on in silhouette, next to an innocuous baseball trophy, its tiny batter poised on a two-handled loving cup. The plane had streaked by with such speed, Nuñez had not even realized he had caught it on film until he finally got around to developing the roll a week or two later. - David Friend, Watching the World Change: The Stories Behind the Images of 9/11, Farrar, Straus and Giroux, New York, p. 13. Hereby, I challenge any engineer specialized in crash physics to explain what we see in the 4 below videos. 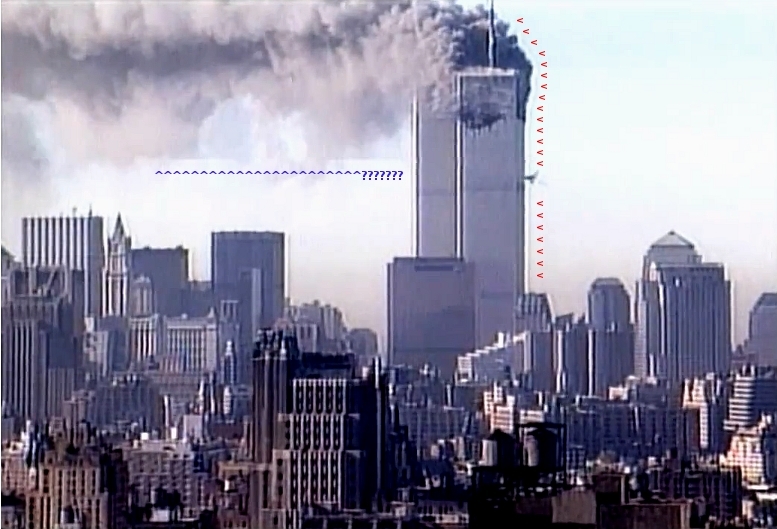 How does this aluminum airliner penetrate the steel structure of the WTC without a single part shearing off? To be sure, this is a still completely unresolved issue to this day. NOT ONE individual contending that these are REAL videos has ever tackled this basic issue in any sort of scientific, peer-reviewed manner. Peer-reviewed? Yes well, that is a common requirement for any thesis/analysis to be deemed valid by our planet's scientific community. manufactured for reasons we may easily surmise; Since there are no real videos of the morning's events, simulations such as this serve one important purpose : to convey the idea that "scores of people witnessed the events unfold before their very eyes". In the top photo, directly beneath the yellow Kodak camera, isn't there something odd about the row of 7 black windows in the building on the right hand side? Shouldn't they be brown, not black - the same as in the photo underneath it showing the same building? Could someone with better eyesight than I have look carefully and compare these two photos, and especially the rows of windows? 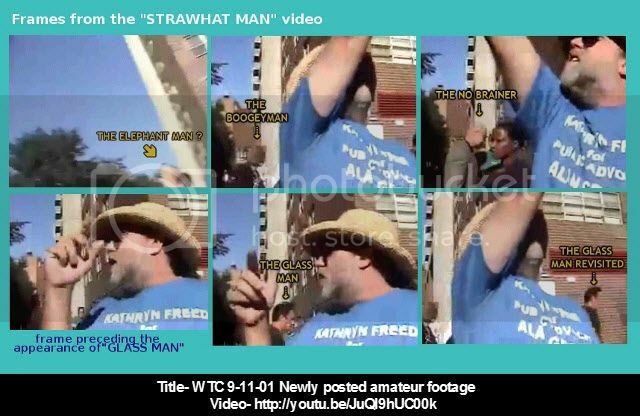 Cheers, LUX I have added yours and re-archived the “STRAW HAT” MAN” Clue. There are copies of all the CLUES, YOUTUBE VIDEOS, AND GIFS.. on my hard drive. In case anything gets lost, copies of videos are also being re-uploaded to you tube being re-uploaded I'm also sharing on face-book. I had a closer look, and from the start, I thought it looked like as though there are some windows missing! But as I looked closer, I realized that all is in check. I see exactly what you mean though. But after a bit of zooming in. As far I can see, the black windows add up.